Why Is Your Older Dog Peeing in House? What to Do If Older Dog Is Peeing in House? There is obviously something wrong if your house trained and well behaved dog starts peeing in the house. 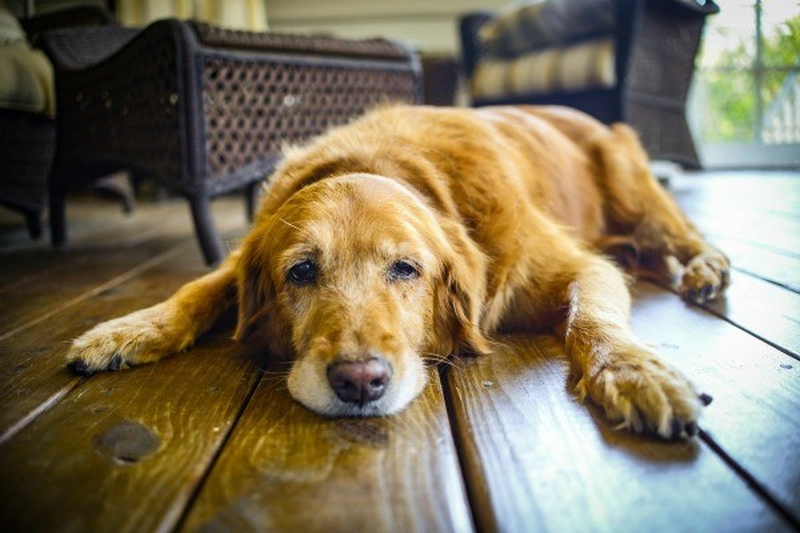 You have trained your dog and know your dog better than anyone else, but it will take some time to determine the underlying cause of your older dog’s condition. There can be a number of factors making your dog behave abnormally. Here are some possible explanations why things are changing with your beloved dog. Dogs may pee when they’re overexcited, but in that case, they will show joyous behavior, such as jiggling, wiggling, and jumping as they urinate in the house. You may find them spraying the urine everywhere. This is quite the opposite of overexcitement, as dogs may pee when they are afraid of something. They will show submissive behavior. You may have to deal with submissive urination when you lean over your dog or scold them. Your older dog may appear comfortable at first, but you may see them urinate when the interactions with you or a stranger get too scary. Dogs may urinate to mark, and they do it for many reasons. Once you notice your older dog peeing in house, you should hope that it is not marking because once it starts it becomes a pattern for your dog. You will find them urinating small amounts in certain areas around your house. If one of your dogs develops this pattern, your other dogs may follow suit. Even well-behaved dogs can start peeing in the house when there is an underlying medical disorder. It could happen due to bladder stones, urinary infections, diabetes, and kidney disease. These medical problems do not give dogs enough time to go out of the house to urinate. Big changes in the lives of dogs can make them feel nervous and stressed, and this could make them urinate in the house. This could happen when you get a new dog or pet, relocate, or have someone else join your family, like a new baby. Some dogs are more anxious as compared to some others, but it is quite common for older dogs to become more fragile over time. You may notice submissive urination when your dog is confronted by a stranger. Your dog may develop separation anxiety, which means that they will become terrified when you are not around. They are likely to lose control of their bladder and bowels if they get hysterical. Anxiety in dogs can also lead to several other medical problems, and things become even difficult when there are physical changes taking place, such as canine dysfunction syndrome, vision/hearing loss, or chronic pain. Once you know that there is something wrong with your older dog peeing in house, you will have to take some steps to help your older dog feel better again. Here is what you can do. This will help determine the underlying cause of this behavioral change. Your vet will also rule out the possibility of serious medical issues. Keep in mind that if your dog is physically fine, there could be an indirect issue leading to incontinence. Sometimes, a behavior change is due to dogs finding it difficult to move because of joint pain. Reduced eyesight will make matters worse. It is also possible that your elderly dog is experiencing cognitive decline, which makes it difficult for them to figure where they are and they urinate without much knowledge of their surroundings. Your vet will help identify exactly what physical problem is making things difficult for your beloved dog. Sometimes, your dog is physically healthy, but may continue to pee in the house because of other reasons. Here is how to proceed in this case. Wondering what to do with older dog peeing in house? You will have to play your part to establish roles. Ensure that your dog recognizes his/her name and knows that you are the leader here. Without this relationship of mutual recognition, you just cannot go any further with teaching your dog how to behave. You can always make them feel interested and attentive by using treats. Call them by their name and when they listen, give them toys or treats. Keep repeating their name when playing with them. When they do not listen to you, it is important to show your displeasure in a firm voice. This will help your dog understand what is acceptable in this house and what is not. It is important to tell your dog that they have made a mistake and they should avoid it in the future. For this, you have to be loud and firm. Of course, you do not have to scream, but your voice should exhibit your displeasure. If you do not react thinking how cute your dog is, you will never be able to teach them how to behave when in the house. However, it is equally important to praise your dog whenever they deserve it. This will help them understand the difference between the right and wrong. They will develop an understanding of things that make you mad, and they will avoid it unconsciously. So, ensure that you do not keep your happiness secret, or else it will leave your dog confused and make communication a lot more difficult.